Gaius Maro is an Imperial warrior, an officer of the Penitus Oculatus and the son of Commander Maro. He is appointed by his father to "personally verify the security of every city in the province" in advance of the Emperor's visit to Skyrim. Gaius wears a complete set of Penitus Oculatus equipment. 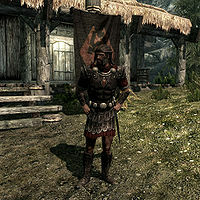 This includes the Penitus Oculatus armor, a pair of Penitus Oculatus bracers, a pair of Penitus Oculatus boots, and a Penitus Oculatus helmet. He is equipped with an Imperial sword and carries a torch. At the start of his journey, you will witness his father talking to him, regarding his safety before he leaves. "After I kill you, I'm going to kill the Emperor." "What? Filthy assassin! We'll see who lies dead!" "Traveling alone can be so dangerous..."
"Is that a threat? Back off, or by the Eight I'll cleave that arrogant head from its shoulders." "I'm sorry, but I really don't have time for this. Move along." If you try and talk to him afterwards, you will only get an angry; "You are trying my patience, citizen. Back away. Now." He is referred to as Voltus by some game data. This page was last modified on 18 July 2018, at 23:10.